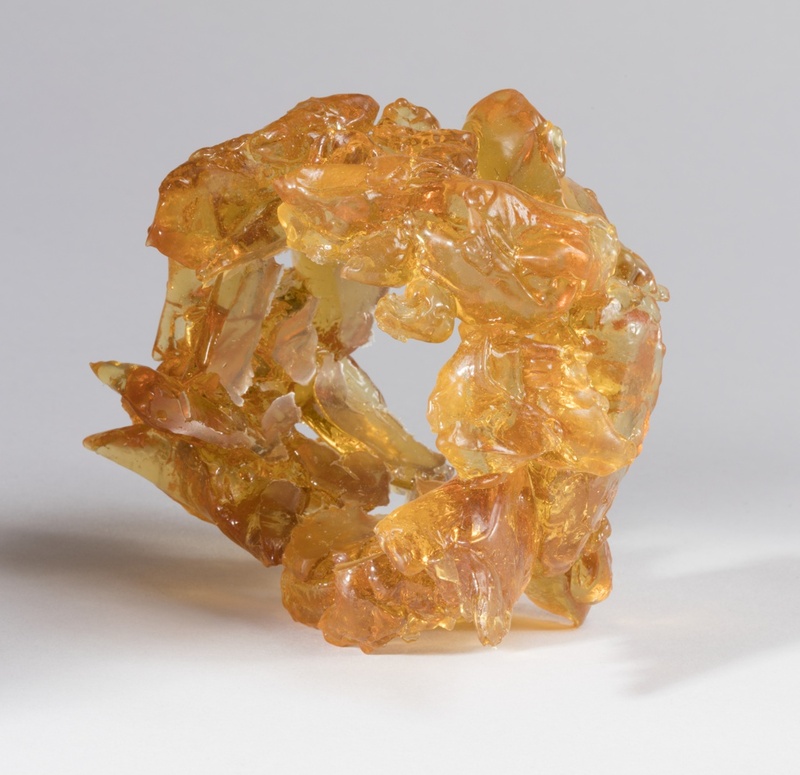 During the last decade, Gaetano Pesce, long known for his varied designs and sense of experimentation, turned his attention to the creation of jewelry. Throughout his career Pesce has used resin to create such diverse objects as furniture, vases and shoes. Experimenting further, Pesce sought to create jewelry with this highly adaptable medium. To date, Pesce has made dozens of works by blending resins into the multitude of colors and textures which best suited the need of each piece of jewelry he created. In the case of this bracelet, Pesce used a transparent golden resin to create the illusion of amber or topaz. Through the process of casting he was able to achieve the rough look of natural stones while maintaining the soft, springy texture of the resin, thus making the form more comfortable to wear than the hard material it emulates. With its resin “gemstones,” this bracelet firmly represents Pesce’s desire to elevate more mundane materials to the realm of the precious. The molding process used to create this cuff bracelet represents a different approach to resin jewelry making for Pesce, because alternatively he creates pieces through the free flow of the viscous material. While many look at jewelry expecting to see precious gems and metals, Pesce used alternative materials hoping that their extraordinary color and design would elevate the ordinary to the extraordinary. This bracelet further exemplifies Pesce’s talent. Born in La Spezia, Italy, Pesce studied architecture at the University of Venice. In over 40 years of practice, the versatile Pesce has undertaken a range of commissions from architecture to urban planning, interior design, industrial design, lighting, furniture, and publishing. As one of the most unconventional and multi-talented designers of the twentieth and twenty-first centuries, he has become known for his explorations of, and innovative approaches to materials and production processes. This bracelet is one of more than 150 pieces of contemporary jewelry featured in Jewelry of Ideas: Gifts from the Susan Grant Lewin Collection, now on view.